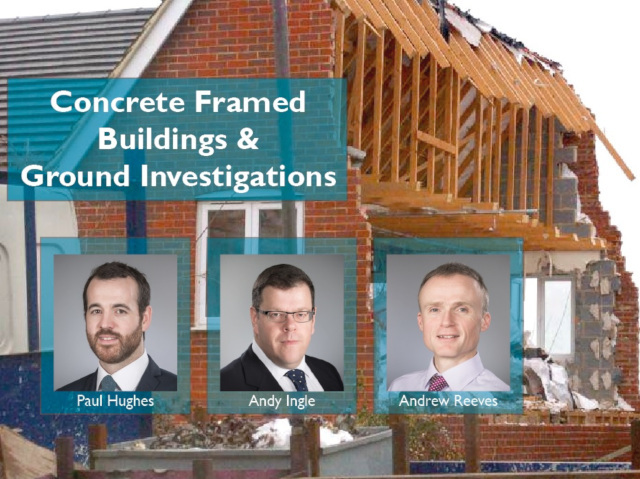 Recently, Paul Hughes of Hawkins’ London Office, together with Andy Ingle and Andrew Reeves of Hawkins’ Reigate Office, gave two Civil and Structural Engineering presentations for Zurich’s offices in London. The subjects of their presentations were: Defects in Concrete Framed Buildings, and The Importance of Ground Investigation. Part of the first presentation focused on specific cases in which Hawkins’ civil engineers have undertaken due diligence for clients who wish to purchase a property from a developer. Some of the known issues that civil engineers have faced in their casework are: design and construction defects, understrength concrete, missing reinforcement (especially at columns), and even instances in which the original developer or contractor has gone bankrupt. Strengthening can be done through carbon fibre reinforced polymer (CFRP) wrap, through bolts, and through steelwork. As well as investigating ways to strengthen the structural aspects of a building, it’s also important to make sure that surface drainage and sewers are installed correctly and according to compliance requirements. Civil Engineer Andrew Reeves (pictured) has written two longer articles on Ground Related Failures; the first article goes into more depth on Ground Investigation Issues, while the second focuses on Design Stage Issues. For each of the five case examples, the civil engineers outlined the steps they take in order to produce a factual and interpretive report. And while plenty of time is spent testing, both on site and in the lab, they revealed that an initial desktop study is often crucial in the assessment of an area’s geology, soil, topology, and past usage. If you would like to schedule a presentation from a civil engineer at your office, or to instruct a civil engineer on a design review, please contact us.